I'm presuming most of you are watching (or have watched some of) the London Olympics. My niece Kaylee is a gymnast and my parents' tv is much smaller than ours, so we invited Kaylee to come over and watch the women's all-around qualification at our house. Even though I knew ahead a time of the results, I still sat on the edge of my seat during each routine. By now we all know how she placed 4th in qualifications yet didn't make the all-around competition because each country can only send its two highest-scoring athletes. Think of the all-around qualification in the same manner as the Olympic trials. The athletes are competing for their opportunity to participate as individuals at the Olympics. In every sport, there is a per-country athlete limit. Even if the U.S. has the third-fastest swimmer in the world, they can't compete in the Olympic Games due to a two-athlete-per-event rule. Kinda reminds me of professional football. Of the 100,000 high school football players, only 0.2% go on to play in the NFL. I'm glad the NFL has a per-university athlete limit for going-pro per year. What!? You mean there isn't a limit. Notre Dame has had 503 student-athletes gone on to play in the NFL. USC has had 438. Ohio State 378. Michigan 332. Penn State 325. Nebraska 312. Oklahoma 296. While I'm no NCAA football expert, I know that those are seven powerhouses--universitiesg going to Bowl games year after year after year. Usually. Go little university that's so small I don't know your name! Recently the Christy Awards annouced their finalists. Of all the things I noticed, the one that stood out the most to me were the number of books published by large CBA publishers. Please know I have no ilk with any large CBA publisher. I love them. I have two novellas published with one. Pondering here. What if publishers had to follow a per-publisher limit when entering books in a contest? Say, each publisher sends their four or five strongest athletes . . . umm, books to a contest (Christy, Carol, Rita, etc). Wouldn't, then, smaller publishers have statistically a more equal chance of finaling? In the ACFW Carol Award, amid books from large and uber-large publishers were two finalists from little-known (but growing) publishers: Port Yonder Press and Marcher Lord Press. Yay for them! As a Carol judge, I encourage you to read over the list of finalists and buy the books you haven't read. Fairness. Should it exist? Has our we-now-use-green-pens-because-red-ones-are-offensive/hurtful society become too fair? What about you? Do you think the per-country limit is reasonable? And what about in publishing? With the growing number of small presses (print and digital), wouldn't you like to see books published by small presses final in prestigious contests? Do you think small press novels aren't given a fair shake by judges? . Before you answer, let me go a bit more personal. Is winning your goal? Or can you be content to take par? Do you "be content"? Is triumphing the only thing that matters? Or can you enjoy the struggle? Do you "enjoy the struggle"? Have you lately? Are you right now enjoying not having _______ (fill in blank with something you want but aren't getting while, maybe, others are)? Can you rejoice in another's success while you fail? As Followers of Jesus, how do we reconcile "I can do all things with Christ who strengthens me" with "be content in all things"? GINA WELBORN is an author, mother, wife, and currently has changed her Level 4 brown hair to Level 7 blonde. She's still debating if she likes it. 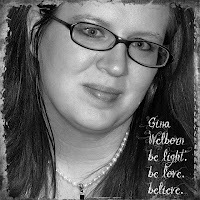 For those of you who are far more interested in what Gina writes than in her hair-color dilemma (gray hair causes one to take drastic measures), her first novella "Sugarplum Hearts" released in February 2012 in HIGHLAND CROSSINGS. Her second novella "All Ye Faithful" in A CASCADES CHRISTMAS is available for pre-order on Amazon, CBD, Barnes and Noble, as well as other online distributors. Gina resides in a wee little town outside a larger (but not large) town in Oklahoma. Thanks to her pastor-husband's ability to spray a fabulous chemical called Demon, her children don't get to enjoy raising hunter spiders, grasshoppers, and crickets. While they are (mostly) saddened, Gina is delighted. and blonde. Really? must see a photo. Yeah, the Jordan thing is too sad. And maybe I'm crazy, but it occurred to me while reading this that we should pray against any abuse of the Russian girls over their loss. The dark haired one looked sort of scared and haunted before she performed. I, too, wondered what abuse the Russian girls might receive after their performance last night. Dina, I couldn't figure if she really looked scared/sad or if the heavy eye makeup she wore added to the expression. Deb, the rule isn't relatively new. Maybe since 1984 or something. My theory is that because advertisers and NBC bulit Jordyn up as the star gymnast, they had to emphasize the "travesty" of her not making the cut instead of explaining "This is the rule and this is why it exists." Plus, it's not as if the athletes didn't know ahead of time about the rule. Three American girls were competing for the two spots. They knew one of them wouldn't make it. I suspect they figured Aly would be the unfortunate one. Yes, blonde. We'll see if I still have it by conference. ;-) I went from level 4 brunette to level 9 - 10 blonde which was too yellowy white so I brought it back down to level 7. Color is supposed to be medium ash blonde. Not very ashy. I may strip the color in spots to create highlights without having to bleach again. I couldn't stay up to watch the end of the gymnastics last night, but I'm so excited for our team! As for the poor Russian girl, oh wow. We need to see pics of blonde Gina! Since I'm not home yet, I haven't had a chance to just sit and watch tv. Hopefully will catch up on all the Olympic news tomorrow. I'm at the airport waiting for my flight home and although their are tv screens everywhere, I'm at a table with plug-ins so I can work, but I can't hear the tv. It seems that each country in figure skating can send 1 person/team in each discipline, and more as their skills warrant. For awhile in Men's figure skating, Canada was blessed to have 2 men ranked in the world's top 10. I believe we were able to send 3 men to the Olympics that year. However, in Pair's figure skating, we only had 1 top ranked team, so could only send 2 teams. I really like this system it guarantees each country a spot, plus more for those athletes/countries who work harder to rank higher. In other words, it's fair, but gives bonus points for hard work and effort. As I understand, book awards like the Carol, are given out to books that the authors submit themselves. I believe that's why you see many repeat authors finaling. Those authors have enough confidence in their books to submit it in a contest. I thought I heard once that unlike most book contests, the Christy is entered by the publisher. If there are too many large publishers entering the Christy, why aren't the smaller pubs entering more? Don't they have confidence in their authors? I think book contests like the Christy should be like the figure skating... give every publisher a chance to enter their best book, and then allow more books based on sales figures. The 2 per country limit is new. The Olympic committee decided to reward diversity over achievement. "Because of a rule, in place at the Olympics since 2004, that limits each country to only two competitors among the 24 competing in the all-around final. Must know how your blonde turned out... contemplating the same.